Hi all I would like to wish everyone a very happy new year. In November last year I decided to give up crafting as I lost my mojo and interest. And this week I realised i missed it so much so here I am making cards again and I am so happy. 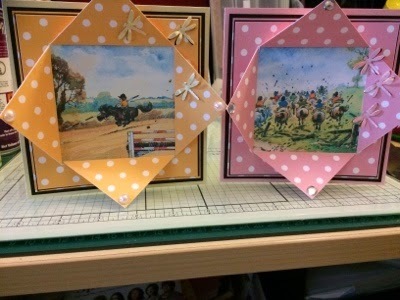 I got the new Thelwell cd rom from crafters companion as I fell in love with it and I made the fold over card which is from the cd rom. I used pearlised card stock in yellow and pink and cut them down to 5 1/2 inches x 11 inches and folded it in half then matted and layered using black card stock. I used from my stash the pearl & gem stones. And I used a dragonfly punch and cut out 3 gold and 3 matching card stock for each card. These are wonderful Sam! Love the images. So glad you are back doing something you love, the cards are totally gorgeous! Also, huge congrats on the weightloss, that is a wonderful achievement and you have every right to be proud and happy of it. Hello Sam, welcome back. Your mojo has certainly returned. These two cards are absolutely fabulous. Love the design.